A chandelier should be hung in the center of a foyer or entryway. If your foyer has a window above the door, the chandelier should be centered in the window so that it can be seen from the outside of the home. If an entryway is two stories tall, the chandelier shouldn’t hang below the second floor. If an entryway is one story tall, the bottom of the chandelier should be about 7 feet from the floor. Height. The higher the ceiling, the taller the chandelier. The rule of thumb is 2.5-3 inches for each foot of ceiling height. A standard 8-foot ceiling will accommodate a chandelier that is 20-24 inches in height. To avoid bumping heads, a chandelier that’s hung above a table should have a diameter 1 foot narrower than the table’s width. Chandeliers should be centered over the dining table. The exception to this is if you’re placing two smaller chandeliers over the table instead of one. 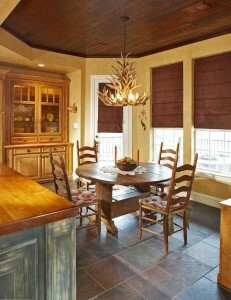 A light fixture should be hung 30-34 inches above the dining table. This same rule holds true for lighting over islands and kitchen tables. For ceilings higher than 8 feet, add about three inches to the hanging height per foot. So if your ceiling is 10 feet tall, your lighting fixture should be hung 36-40 inches over the table.